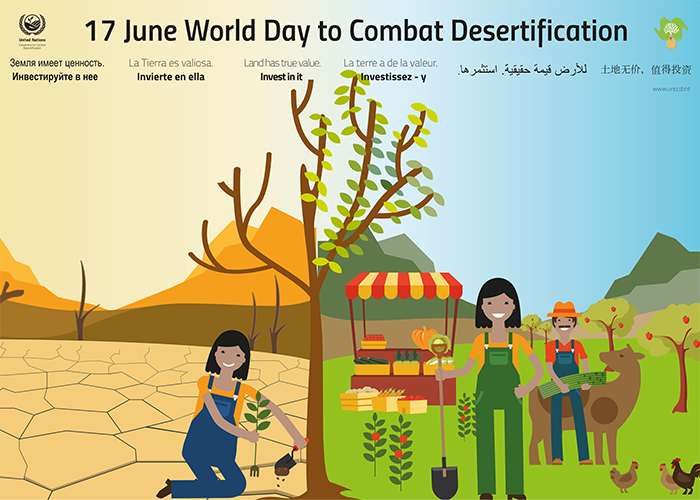 World Day to Combat Desertification and Drought (#2018WDCD), declared by the United Nations to raise the public’s awareness of the efforts made all over the world to combat desertification and encourage involvement of communities and cooperation at local, national and international level, is celebrated on 17 June each year. Desertification, along with drought and land degradation, is one of the major threats to the environment. To mark the day this year, the Director General of UNESCO, Irina Bokova, stated: “We must not only look at its economic value. Land is worth much more. It defines the way we live and our culture – whether we live in cities or in villages. It purifies the water we drink. It feeds us. It surrounds us with beauty.” These are very meaningful words that are summed up well by the slogan launched for 2018: “Land has true value – invest in it” to raise awareness of the population and governments on the real value of land and on the fact that wise and far-seeing investments will give us more guarantees for the future. The Day was first set up on 30 January 1995 by the United Nations General Assembly Resolution A/RES/49/1995, which stated that desertification and drought are problems of global dimension in that they affect all regions of the world and that, to combat desertification and drought, not only joint action by the international community is needed, but also promotion of public awareness, by publication of research, conferences that show the effects of drought and impoverishment of soil and actions to be undertaken to mitigate these problems. We generally think of land as an unlimited resource, ignoring its role in everyday life. We think that desertification depends only on drought and lack of water, but very often one of the major causes is human activity: intensive cultivation and pastures, monoculture farming, incorrect management of water resources, felling of trees, use of pesticides and chemicals. These operations eliminate vegetation and impoverish soil and have an impact both on the ecosystem and directly on the conditions of human life, increasing famine, poverty, migration and political, economic and social unrest. Moreover, the food we eat, the clothes we wear, the houses we live in, are based on and require use of land. According to a study by Economics of Land Degradation Initiative, each year, 75 billion tons of arable soil is lost, translating into a loss of economic benefits equivalent to 400 billion dollars a year at world level. But what is the situation in Italy? According to the “Atlante delle aree a rischio desertificazione” (Atlas of areas at risk of desertification), published by the Istituto Nazionale di Economia Agraria (INEA – National Institute of Agricultural Economics), 51.8% of Italian territory is considered potentially at risk of desertification. The regions hardest hit are principally those in Southern Italy, but also include part of Lazio, Abruzzo, Molise, Tuscany, Marche and Umbria. The results published in the Atlas show that 4.3% of Italian territory (more than a million hectares, equivalent to 1.3 million football fields) already suffers from functional sterility characteristics; 4.7% is sensitive to desertification phenomena and 12.3% can be considered vulnerable to desertification. The purpose of these Days is therefore to promote, by international cooperation, sustainable economic growth and sustainable use of water and ground resources to prevent desertification. Everyone has their own role: producers, governments and consumers. Nature offers us many opportunities: it is our responsibility to work together to change our methods of producing, consuming and working to sustainable ones that do not endanger our future. That do not endanger the land we all depend upon.